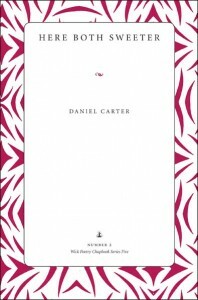 Description Daniel Carter’s Here Both Sweeter is a book in which you “have a seedling in each pocket,” a “body bodies,” and words are something you “carve out” so as to make a home. The poems are stories, are seeds, are secret messages cast and sent across the natural world to a reader, where they blossom in the imagination. The plot is “scatter-wild,” the lyrics “all willful and fallow.” Carter’s language serves as a garden, rich and strange, full of acorns and ink and ash, and in it the green world (of nature, of the heart and body, of words and ideas) is overturned, recycled, and remade. Author Daniel Carter is the author of This Apparatus, 2012. His poems have appeared in Crazyhorse, The AWL, The Offending Adam, and elsewhere.